Page Updated Dover:- Wednesday, 19 December, 2018. The picture above was taken, date unknown. The Barley Mow is indicated by the "X". Facing the dockside, numbers 51 to 58 were a continuation of Commercial Quay and were removed with those properties in 1929-30. A sheaf suggests an appropriate sign but the name could have associations with Barley Mow Passage which separated 81 and 83 Snargate Street. Its neighbour would have been the "Union Hotel" which disappeared in the same purge, apparently going first, because early in 1930, the "Barley Mow" and the "New Commercial Quay Inn" were the only two pubs Open 2014+ in the area designated for clearance. An outlet of George Beer at the close, it was in the care of Jack Cesar in 1805. 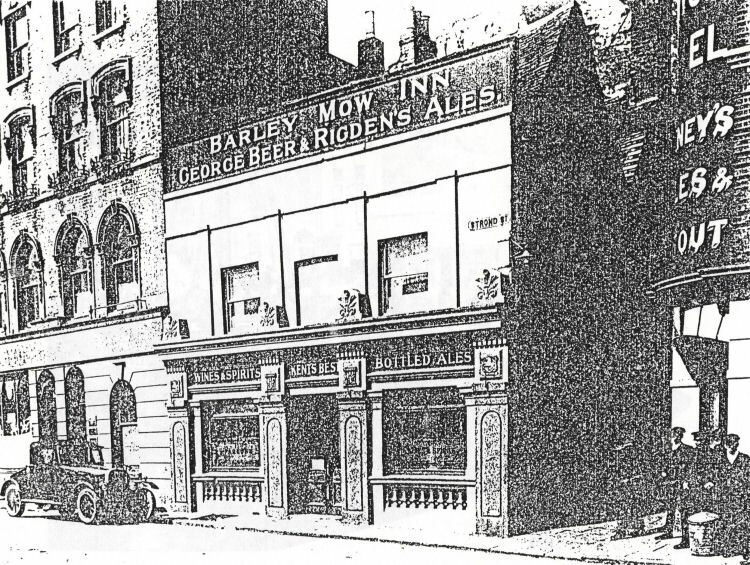 Permission to sell at the "Barley Mow" until the adjourned licensing day was granted to Mr. H. J. Meadows, as brewer's agent. From the Dover Express and East Kent News, Friday, 10 June, 1870. Josiah Jones, a labourer, was charged with stealing 6s. the money of James Epps, a man with whom he had been employed. James Epps: I am a labourer and live at Finnis's Hill. I have recently been employed on board a steam collier in company with the prisoner. Last Saturday evening, I was at the "Barley Mow," with the prisoner, and got very tipsy. When I went into the public-house I had about seven shillings in the left hand pocket of my jacket .While sitting there I lost the whole of the money, and I saw the prisoner's hand come out of the pocket. I asked him to give me the money back again, and he said he had not got it. We then got to blows, and after we had done fighting he went into the packet yard. I afterwards gave information to a policeman who came along at the time, and the prisoner was then taken into custody. By the Bench: I had been drinking with the prisoner for about an hour and a half. We had been working together that day, and on getting paid we went to the public-house. John McSchane, a private in the 97th Regiment, said that about five o'clock on Saturday evening he was in the "Barley Mow" public-house, where he saw the prisoner and the other man. They were drinking together and afterwards got to blows. In the course of the scuffle the prisoner took hold of the other man and declared he would put him on the fire place; and as he had hold of the prosecutor witness saw him put his hand in his pocket and take out some money. Among the money were two two-shilling pieces, a shilling, and some coppers. The prisoner afterwards ran out of the house and the prosecutor followed him, and they commenced fighting again. The prisoner afterwards went into a coal yard, where he was found by the police, in a little shed. Police-constable John Sabin: On Saturday evening I went into the packet yard, in consequence of what I heard, and found the prisoner in a shed. He was very drunk; but he understood the nature of the charge made against him, and said he was not guilty. I told him I should see what money he had about him, and on searching him I found among his money two two-shilling pieces, and some coppers. The complainant was also drunk. The soldier, however, was sober; and on his telling me that he saw the prisoner take the money out of the other man's pocket, I detained the prisoner. The prisoner denied the charge; but said he was very drunk at the time. The Magistrates committed him for trial at the next Quarter Sessions. From the Dover Express and East Kent News, Friday, 27 September, 1889. Price 1d. On Monday at the Police Court, George Hayes was charged with being drunk, using obscene language, and assaulting Police-constable Cadman whilst in the execution of his duty. Police-sergeant Nash said on Saturday night about a quarter past eleven he was on duty in Strond Street when his attention was called to Commercial Quay by there being a crowd of people near the “Barley Mow” public house. He went there and saw the prisoner lying in the road drunk, blood trickling down his face from a cut over the right eye. A woman who was with the man, said that a sailor had struck him. The Constable got him up, and as soon as he was on his feet he placed himself in a fighting attitude towards a sailor. They got the prisoner away, and the woman and some civilians tried to get him home. When he got over Limekiln Bridge he commenced fighting with a man, and the Police then took him into custody. He put his leg around Police-constable Cadman and tripped him to the ground. After that he walked quietly a little way then tripped Cadman again, both falling to the ground. With the assistance of the Military Police the man was handcuffed, and whilst this was being done he knocked Cadman in the head with his knee. When we got up, he attempted to trip Cadman again, and they had to frogmarch him until the ambulance was obtained, and they placed him in it and brought him to the station. The prisoner was sentenced to fourteen days' hard labour for being drunk and disorderly, and one month for assaulting the Police. Five a.m. opening was allowed from 1881 but by 1900 that was extended to three thirty a.m.
David Torr, in 1890 had fourteen pounds of tobacco on the premises which the revenue men considered he had not declared. Apart from his fine of £5.10s. and the loss of his right to draw, the Bench seem to have overstepped their authority when they refused the licence transfer to another member of the trade. By access to higher channels, James Dolbear effected a reopening here in October that year. From the Dover Express and East Kent News, Friday 7 March, 1890. David Torr, the landlord of the “Barley Mow Inn,” was charged at yesterday's Police Court, before T. V. Brown, Esq. (in the chair), and M. Pepper Esq., with having concealed on his premises 14 pounds of smuggled foreign manufactured Cavendish tobacco. The court was crowded, a good deal of interest being manifested in this case. Mr. J. Titterton said he appeared on behalf of the Customs House authorities. He asked that the treble value and duty should be inflicted, instead of the £100 which the defendant was liable to pay. James Hutchinson, Custom House officer, belonging to the detective staff of London, said: On Tuesday I received a telegram from Mr. Titterton, who was at Dover. I proceeded to Dover and arrived here about ten o'clock on Tuesday night. On Wednesday morning, about eleven o'clock, I proceeded, under the supervision of Mr. Titterton, to the “Barley Mow,” Strond Street, for the purpose of searching the premises for contraband tobacco. Mr. Titterton asked the defendant, who is landlord of the house, if he had any foreign tobacco or cigars on the premises for which duty had not been paid. He replied that he had nothing on which duty had not been paid. He produced some tobacco and a few cigars, and the receipts for the same. By Mr. Titterton's suggestion, I then searched the bar and back parlour. The defendant seemed very agitated whilst I was doing this, and repeatedly asked Mr. Titterton to have some refreshment, which was declined. I then proceeded to rummage the smoking room. After searching for some time, I found under the sofa, the tobacco produced, spread out on the floor. I immediately called Mr. Titterton's attention to the discovery. He questioned the defendant, who said he knew nothing about it, but that there had been a couple of sailors in the room a short time before, and they must have left it there. I searched the other parts of the house, but did not find anything else. The weight of the tobacco is 14 pounds, and the single value and duty is £4 11s. By the defendant: I searched your rooms, but did not find anything else there. The room where the tobacco was found seems to be a public smoking room. James Titterton, detective examining officer of Her Majesty's Customs, London, said: At about eleven o'clock on Wednesday morning, acting under instructions received from the Commissioner of Customs, I proceeded to the “Barley Mow.” I told the landlord who I was , and that I had come to search his house, producing my authority to search for smuggled goods. I asked him to produce to me all the goods liable to duty he had on the premises. He produced some goods for which he had invoices. He said he had no others. The men who were with me, then searched the house. Hutchison, who was in the front room downstairs, which is entered from the bar, asked me to step inside, as he had found something under the sofa. On stooping down, I saw the tobacco produced. I called the defendant, and asked him if he could give any explanation as to how it came there. He said he knew nothing about it, but there had been some sailors in the room that morning, and they must have left it there. The tobacco was packed after the fashion of a cork belt, so that it can be tied round a person's body, and not be noticed. By the defendant: About an hour after we found the tobacco, several foreign sailors came in, I searched them, but did not find anything contraband. Mr. Titterton then said that was all the evidence he was prepared to offer that day, and if their Worships were not satisfied he would like an adjournment, when the Crown solicitor would appear. The defendant said he would also like an adjournment so that he could have legal aid. The Magistrates accordingly adjourned the case till next Tuesday. From the Dover Express and East Kent News, Friday 14 March, 1890. Yesterday at the Police Court, before T. V. brown, Esq., and Mr. M. Pepper, Esq., the remanded case of D. Lorr, landlord of the “Barley Mow,” who was charged with having in his possession, smuggled tobacco, was heard. The Court was densely crowded, great interest being manifested in the case. Mr. J. Macklin barrister of the Solicitors department, Custom House, appeared for the prosecution, and Mr. Martyn Mowll for the defendant. James Hutchinson was recalled, and the evidence he gave at the last sitting was read over. By Mr. Macklin: The 15 packages of tobacco were, as he stated before, not placed, as if they had been thrown hastily under the sofa. There was one window in the room, the light of which was obstructed by a screen and a blind. The sofa was right against a window. Re-examined by Mr. Macklin: He did not think anyone could go from or come into the room without being seen in the bar. Mr. Titterton was also re-called and his previous evidence was read over. In reply to Mr. Maclin, he said that the smoking room is entered from the public bar. By Mr. Mowll: When I told Mr. Torr that I had found the tobacco he said “Go and ask the servant who cleans the room out every morning, and she will tell you if it was under there this morning. I asked her, before Mr. Torr could speak to her, and she said that there was not anything under there that morning. The Chairman said that they had carefully considered the case, and had come to the conclusion that it had been proved. But taking into consideration that, whilst the defendant was in possession of the house, there had been no complaints, they had come to the decision of inflicting a minimal penalty. He would be fined the single value and the costs of the court, amounting altogether to £5 10s. From the Dover Express and East Kent News, Friday 29 August, 1890. The licence for this house had been allowed to stand over, notice of opposition having been given by the Superintendent of Police. Sergeant Nash proved having served the notice on the landlord, David Torr, on the 16th of August. The grounds of the objection were, that the landlord was not a fit person to hold a licence, that he and his wife were frequently drunk, and that on the 13th of March, 14lbs of smuggled tobacco was found concealed in his house. Mr. Torr said he appeared for himself. Mr. Worsfold Mowll said he appeared for Messrs. G. Beer & Co. and said it was understood that Torr was going out , and that the matter should be adjourned to Broadstairs for a suitable tenant to be put forward. Mr. Torr said he was there to defend himself against the complaints made against his management of the house. The Magistrates decided to hear the case. Sir Richard Dickeson said that they could not alter the rule in this case. A special notice of the rule had been sent to each one holding a licence. The Superintendent of the Police said that on the 18th of July this year, he was in Snargate Street, when his attention was called to a child named Maud Torr, about eight years of age. She was very wet and cold, it being a wet day. He took her to her father's house, the “Barley Mow Inn,” and there he found that the mother was in bed drunk, and the father not sober. He told the father to give the child food, but he said he had no fire in the house, and was going to give her port wine. The Superintendent then took the child to a coffee shop, and got her proper food. He could not get any guarantee that the child would be properly treated, so he sent her to a relation, who took charge of her for the night. Torr and his wife were summoned for neglecting the child, and the case was adjourned for two or three months, for him to put the child where it would be properly treated. Police-constable Knott was called, and corroborated Superintendent Sander's evidence. Witness said he had been called to the house on two or three occasions when there was disturbances between Mr. Torr and his wife. Neither of them were sober when witness had gone to the house. Police-constable Fogg deposed: On July 10th, in consequence of something I was told, I went to Strond Street, and saw a large crowd of people outside the “Barley Mow” public-house. Mrs. Torr was the worse for drink, and was standing near the door with her face covered with blood. I went into the house, and saw the landlord, who was also drunk. I have seen Mr. Torr the worse for drink on more than one occasion, and also his wife. Mr. Torr said he did not see why he should have to leave his house through his wife misbehaving herself. He had been nearly twelve years there. From the Dover Express and East Kent News, Friday 12 September, 1890. The adjourned annual Licensing Session was held on Wednesday, at Broadstairs, for Dover and its liberties. Sir Richard Dickenson was in the chair, and there were present Dr. E. F. Astley, T. V. Brown, J. LO. Bradley, W. J. Adcock, and Matthew Pepper, Esqrs. The usual list of licenses for Broadstairs, and the other portion of the adjacent Liberties of Dover were renewed except in one case, reserved for consideration; and the Deputies were, as usual, re-appointed. It will be recollected that this case was heard at Dover, when the Superintendent of the Police objected to the renewal of the license, because, during the year, the house had been badly conducted. On account of the evidence then given, the Bench decided to refuse to renew the license to Mr. D. Torr, the occupier, who was the applicant. Since the sitting at Dover, the tenant, Mr. Torr, had given up the house, and Mr. Dolbear, late of the “Mechanic's Arms,” who had already obtained permission to draw, now applied to have the license granted to him, and Mr. Worsfold Mowll, on behalf of the owners of the house, Messrs. Beer and Co., appeared to support the application. Sir Richard Dickeson, on giving the decision of the Bench, said that they had given the matter their careful consideration. They had not the slightest objection to the new tenant whom the owners proposed, but the Magistrates felt, as the license had been refused for a sufficient reason, it was their duty not to grant the license to anyone else, and they, therefore, declined to grant the application. The license was therefore refused. From the Dover Express and East Kent News, Friday 26 September, 1890. In both cases in which the Dover Magistrates refused, to renew licenses at Broadstairs, namely the “Barley Mow” at Dover, and the “Captain Digby” at Westgate, we were informed that notice of appeal has been given by the respective solicitors engaged. The action of the Dover Magistrates has been similar to a large number of other Licensing Committees in various parts of England, this year. In some cases, many licenses have been refused. Our contemporary, the Deal Telegram reprints and acknowledges the whole of our last week's remarks on the Broadstairs decision, and adds:- The foregoing remarks of our Dover contemporary appear to us peculiarly applicable to our circumstances. No one can deny that the multitude of our licensed houses is far in excess of the requirements of a small town like Deal. If any proof of this were necessary it could be deduced from the fact that strangers are constantly being induced to invest their capital in public-houses, with the result that after a few month's struggling, they leave us poorer than they came. Let anyone who doubts our contention that we are over-supplied with public-houses, make a survey of the town, and his eyes will be opened. Licensed premises will be observed, as thick as blackberries, in the most obscure and quiet neighbourhoods. In some of the shortest streets, two or three will be found in close proximity, whilst in several places they are to be seen actually adjoining each other. The teetotal argument would be that the multiplicity of facilities increases the drinking habits of a community, but this respect of the question is beside our purpose. We would point out that, owing to the over-supply of public-houses, it is a difficult matter for any of them to do a really remunerative business. Lessees and brewers alike, are suffering from the excessive competition; whereas were there some restrictions put upon the number of licenses, all parties interested would recap the benefit, and the hole aspect of character of our streets would be improved. When a house is palpably not required, the Magistrates have the power to close it, with the effect, not of injuring, but of greatly assisting a not too prosperous trade. Instead, we hold that if the brewers would combine for the purpose of closing a certain percentage of their houses, they would find that the advantage of possession a remnant, capable of paying a good dividend, would far outweigh any loss sustained through the depreciation in the selling value of the abandoned licensed premises. We have suggested this reform in the interests of the parties most deeply concerned, and we trust that they will lose no opportunity of giving effect to a course which might be adopted with the most satisfactory result. From the Dover Express and East Kent News, Friday 10 October, 1890. At the East Kent Quarter Sessions held at St. Augustine Session House on Tuesday, Lord Brabourne in the chair, the appeal against the decision of the Dover Magistrates not to renew the license of the “Barley Mow,” Strond Street, was heard; and also the appeal against a like decision given by the Wingham Justices in the case of the “Ship Inn,” Ash. In this case Mr. Lockwood Q.C. 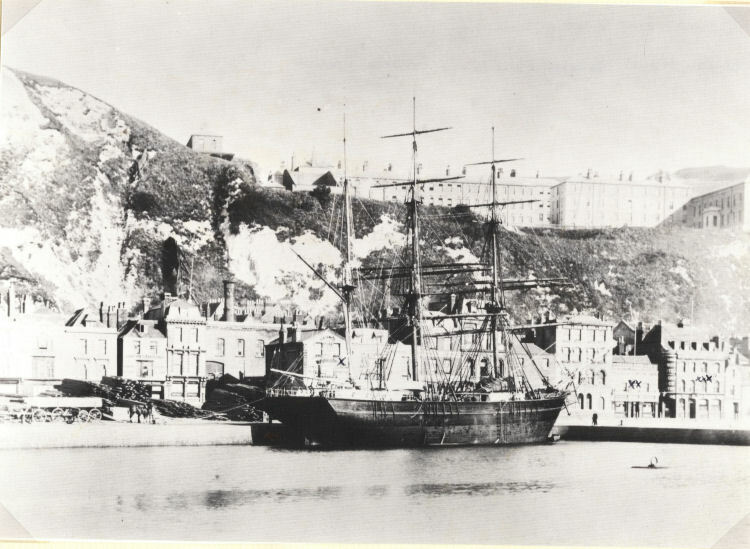 and Mr. Glynn instructed by Messrs. Mowll & Mowll, Solicitors supported the appeal, and Mr. Lumley Smith with whom was Mr. D'Eyncourt instructed by the Town Clerk of Dover appeared for the Dover Justices who were the respondents. At the outset Mr. Lumley Smith required the appellants to formally prove the service of notices and other preliminaries. Mr. Lockwood said that could be easily done only he was anxious to save time. Mr. Lumley Smith said that if his view of the law was correct he thought the case would be shortened by taking the formal course which he had suggested. Mr. Newby formally proved the service of the notice of appeal. Mr. Lumley Smith next called for the production of the recognizance's into which it was necessary that the appellants should enter. The recognizance's were produced by the Clerk of Peace. Mr. Lumley Smith objected that the recognizance's were invalid because they had not been, as he argued was required by IX George IV Cap. 61 Sec., sworn before Justices of the Peace in the place where the cause of appeal rose. He contended that the recognizance's should have been entered into before Magistrates of the Borough of Dover. He contended that while the section to which he was referring expressly provided that in a case arising in a Borough the appeal should be carried to the County Quarter Sessions, but that they must enter into their recognizance's before Justice of the Borough where the case arose. The recognizance's in this case had been entered into before a County Magistrate sitting at Canterbury and that he contended was absolutely fatal to the right of appeal. Mr. Lockwood said his learned friend had spoken of something which had taken place at Dover being carried to appeal; the decision which they were appealing against was given at Broadstairs. Mr. Lumley Smith: This is an appeal from the Borough of Dover. The Chairman: if there are and Dover Magistrates here they will not be able to sit in this case. The Clerk of the Peace: This is an appeal from the Borough of Dover. The Magistrates of the Borough cannot sit here. Mr. Lockwood: I fear I led your lordship wrong by stating that the decision was given at Broadstairs. The Chairman said that Broadstairs was a limb of Dover and part of the same jurisdiction the same as Margate formerly was. Mr. Lockwood contended that a Justice of the peace for the county who was a member of the court where the appeal would be heard was the proper person to take the recognizance. Mr. Lumley Smith replied reiterating his objection which he contended was fatal to the appeal. The Chairman said that the court was always anxious that no one should be debarred from obtaining justice by technical objections. The point in question might be argued if the case were carried to a higher court, but as far as that court was concerned it was against the objection, and the appeal must proceed. Mr. Lumley Smith: I may wish to raise the point in a higher Court. Mr. Lockwood then proceeded to lay before the court the facts of the case. He said he appeared for Mr. Chapman and Mr. Oliver who were the successors to the business now carried on as Messrs. Beer & Co., he also appeared for Mr. Dolbear the present tenant of the “Barley Mow.” The firm of Beer & Co., were the owners of a large number of public houses in the district and if the licensing authorities had decided to reduce the number of public houses in their district, they would, had they communicated their views, met with the co-operation at the hands of the gentlemen whom he represented. In many Licensing Sessions which have been held recently, the Magistrates, had announced their intention of considering not only the character of the houses, but the requirements of the neighbourhood, but he knew of no case where the Magistrates had absolutely refused a license, without any notice whatever. If houses were to be reduced, notice should be given, so that the owners might be prepared with evidence of the requirements of the neighbourhood so that arrangements might be made for weeding out those that were not required and retaining those that were most valuable so that some little regard might be paid to the property of the brewers. What took place in this case? Messrs. Beer & Co. had a tenant in the “Barley Mow” named Torr. Before the Dover Licensing Session this tenant was served with a copy of a statutory notice that he would, at the Licensing Session, be objected to by the Police, as a man not fit to hold the license. Mr. Torr appeared personally before the Bench, and when the case came on he defended his position. Torr had been convicted of some offence against the excise laws, and had been fined £5. That conviction told against him; and it was also alleged by the Police, that he did not conduct the house properly; that he and his wife were in the habit of taking too much drink, and that there were domestic squabbles in the house. He, (Mr. Lockwood), did not attempt to minimize the conduct. His clients felt that there would be a great difficulty in asking the Magistrates to renew the license to a man who had so conducted the house; and their endeavour was to obtain, before the Licensing Sessions, some other persons to whom they could entrust the premises, and to whom they could conscientiously ask the Justices to renew the license. For a time it was hoped that might have been done; but, before the Justices of Dover, Torr refused to give up the license, but the Magistrates, after hearing the evidence refused to renew it to him, and the case was adjourned to the Broadstairs meeting, so that the owners might be prepared with the name of some person to whom this license might be renewed. An intimation to that effect was made to the Appellant's Solicitor, by the Clerk to the Magistrates, in accordance with a custom which has long prevailed in the court. The owners were naturally anxious to obtain a good tenant for this house , which was a very substantial one. He had directed that a photograph should be taken of it so that the court to which they were appealing, should see for themselves. [The photograph was exhibited to the Bench.] Messrs. Beer & Co. being anxious to obtain a good tenant speedily, Mr. Dolbear who was in court, and heard what passed, and who was then holding the license of the “Mechanic's Arms,” another house belonging to the same company, made application and was accepted. They made application to the Dover Borough Justices for a permit to draw until the 10th of October, and that was granted to the new tenant Mr. Dolbear, and the license of the “Mechanic's Arms,” which Mr. Dolbear held was assigned to a new tenant, and a permit was also granted to him to draw at that house till transfer day. Mr. Worsfold Mowll attended the adjourned meeting of the Dover Magistrates at Broadstairs, and according to the express invitation of the Bench sitting at Dover, took a new tenant Dolbear with him. The case was called in the usual way, and Dolbear was put in the box and examined. He was shown to be the present occupier of the premises. This it should be recollected was the adjourned Licensing Session at Broadstairs – part and parcel of the Dover Licensing Session. Dolbear was called to give evidence as being the occupier, and the Superintendent of the Police stated that the man bore an excellent character. That was the only evidence taken. The Magistrates retired; they came back and after giving their decision in other cases said that they were perfectly satisfied to the character of Dolbear, but they refused to renew the license, without taking a tittle of evidence as to the wants of the neighbourhood. He (Mr. Lockwood) would submit with some confidence that the Magistrates had no right to refuse to renew the license without evidence. He would not say that the Magistrates had not the right to refuse to renew the license on those grounds, but he contended that they could not act without sworn evidence as to the neighbourhood. The magistrates might know nothing about the neighbourhood, or, on the other hand they might know a great deal about it, but it was not competent for them to act on their own information. For instance if a Judge were trying a light and air case and he appeared to be passing the place in question in going to his court, he would not look up at the windows and say “Oh, that must be an ancient light,” and then go into court and act on his own knowledge. In the case of Sharp and Wakefield if it was decided that the Magistrates must exercise their functions judicially [Case put in]. In the Court of Appeal Lord Esher said that on the part of the Magistrates there must be a judicial exercise of their discretion. The Magistrates had no right to decide upon their own observations and knowledge; that the Dover magistrates had done at Broadstairs, for they never called a single witness as to the needs of the locality and yet they refused the license. He contended therefore that the Magistrates did not exercise their discretion judicial in refusing that license. He (Mr. Lockwood) appeared on behalf of the brewers for whom this refusal was a serious matter; but he did not suppose that the pecuniary loss which would fall on the brewers would influence any member of the Bench. He also appeared on behalf of the unfortunate man Dolbear, who had invested in this house £350, the savings of a life-time, and he had done this at the express invitation of the Dover Bench. Mr. Lockwood continuing, said he did not know how his friend opposite might be instructed. He saw a young gentleman over there, who seemed to take a lively interest in the case, shake his head, (laughter). He hoped that there was not going to be any contention as to the facts, as to what was said at Dover, because the fact of the case being called at Broadstairs, showed that it was not fully dismissed at Dover. The calling on the case at Broadstairs, was not very different to inviting them to go there. The Chairman: It could not have been finally refused, on why it was mentioned at Broadstairs? Mr. Lockwood: That is my view. Mr. Lumley Smith: It was a refusal to Torr. The Chairman: How did it come on at the adjournment? Mr. Lumley Smith: We never knew it was coming on. Mr. Lockwood: But it did come on; they cannot say it could not come on, because it did come on at Broadstairs. The case of the “Barley Mow” was called in the usual way. The Chairman: Then I understand there were two hearings; one at Dover and one at Broadstairs. Mr. Lumley Smith said that the license was finally refused to Torr at Dover, and then at the adjourned sessions at Broadstairs, Dolbear appeared. The Chairman said that the point was not clear in his mind, whether the license was granted or refused, or whether the Magistrates left it open for another tenant to be found. Mr. Lumley Smith said that if he was rightly instructed, the license was finally refused. Mr. Lockwood: Then why call it on again? The Chairman said he thought they were trying to decide the case before hearing the evidence upon it. Mr. Lockwood said the case at Broadstairs was called on by their own officer in accordance with what the Magistrate's Clerk had at the conclusion of the case at Dover. He was surprised to hear his learned friend object as they had done. He did not think that that was the way that questions of vital importance were to be met. The Chairman: We had better go on to the evidence. Mr. Edward Worsfold Mowll, Solicitor was called. He said: I am a member of the firm of Solicitors, Mowll & Mowll, and was present at the General Annual Licensing Sessions at Dover this year, when the case of the “Barley Mow” License came on. The police had served Torr, the tenant, with notice of objection, that objection was, that he was not a fit and proper person, and after hearing evidence the Magistrates said that they refused to renew the License to Torr. The question was raised of putting a new tenant in the house, and upon that it was adjourned to Broadstairs. In consequence of that we subsequently obtained Mr. Dolbear as a tenant for this house. I also attended at the adjourned meeting at Broadstairs. I waited until this case was called on in the list and I made applications as had been arranged at Dover. I presented a testimonial to Mr. Dolbear's character and Mr. Sandford proved that Dolbear was in possession of the premises. The Magistrates decided not to renew the license. I was struck with horror and amazement, and I made an appeal to them showing what their previous custom had been, but they did not answer my application. Mr. Mowll: I mean they did not accede to my request to reconsider the matter. Cross-examined: The Magistrates of Dover finally refused the license to Torr. It was after that Torr was got out, and Dolbear was got in. Torr did not go out very willingly; that is, he had to have his own valuation. He named £350 as a lump sum. Dolbear agreed to take the house and paid the money. Dolbear's testimony to character had been given when he obtained permission to draw; that is the usual custom. The Superintendent of Police was in Court; the character of the man was gone into, and the magistrates were satisfied. When Mr. Dolbear went to Broadstairs the license had not been transferred to him, but he had only received permission to draw. Mr. Lumley Smith; There are a great many public-houses close to the “Barley Mow.” How many? Mr. Mowll: I cannot say; there are a good many. The Chairman: I understand that it was stated that no evidence was take of requirements of the neighbourhood. Mr. Lumley Smith: I propose to call evidence to show that the neighbourhood does not require this house. The Chairman: And that point never having been raised in the original case? Mr. Lumley Smith said that the requirements of the neighbourhood was a matter that should be considered. Mr. Lockwood objected to the question of the requirements of the neighbourhood being gone into. This was the first intimation that they had had that the license had been refused at Broadstairs on the ground of the requirements of the neighbourhood. He also considered that it would not have been competent to have brought evidence of the requirements of the neighbourhood at Broadstairs because no notice had been served on Dolbear. The Chairman said it appeared evident that the magistrates had not taken any evidence on oath as to the requirements of the neighbourhood, and the point did not seem to have been suggested, until after the second hearing, as he might call it. All the steps seemed to have been take in accordance with the custom of the Bench, and in obedience to the suggestion of the Magistrates' Clerk. It was rather hard to turn round on him now. Mr. Lumley Smith said that the new tenant Dolbear, was not on the same footing as a person holding a license, and was not entitled to notice. Lord Brabourne: I don't think that applies. The Magistrates' Clerk's words are “We refuse to renew the license to this man,” but then it goes on to state what the owners may do. It seems common sense and common justice that they should act thus. There are personal objections to the old tenant, and because of those personal objections the Magistrates refuse to renew the license. I must say as far as I am concerned, that I think it is perfectly incompetent fro you to open now the question as to the requirements of the neighbourhood. Mr. Lumley Smith said the foundation of his case was the requirements of the neighbourhood, and he admitted authorities on that point. Mr. Lockwood said that if the Justices really decided to deal with the cases in consideration of the requirements of the neighbourhood, it would have been fairer to have given notice before the Session that that would be done. He should think it would be fairer to withdraw this appeal and give notice before the next Session, that the Licensing Justices will take into consideration the requirements of the neighbourhood. Mr. Lumley Smith said that the Justices of Dover had acted accordingly to their view of the law. On behalf of the Justices he had no desire to press the matter further. The Chairman: It is the duty of the Court to prevent injustices from being done to this man Dolbear if his license were refused under the circumstances. No doubt there was a misapprehension, but I think the Magistrates with a sincere desire to do their duty to all parties, would be the last to desire to do an injustice if they give notice that in future they give notice that they will go into the general requirements of the neighbourhood, the matter will go on in a proper way. Mr. Lumley Smith: On that understanding I have no objection to withdraw our opposition to the license being granted. The opposition to the appeal was then withdrawn and the appeal was allowed. From the Dover Express and East Kent Intelligencer, 28 March, 1902. Price 1d. William Cox was charged with being drunk and using obscene language in Strond Street. Police-constable Kingsmill said that about 9.30 on Saturday evening he was in Snargate Street, and saw the prisoner, who was drunk and using obscene language. Witness advised him to go away. He went a little way up the street and commenced to dance and shout on the footway. Witness' spoke to him again, and the prisoner then went into Strond Street, where he was turned out from the “Barley Mow.” He was very abusive, and used very bad language, and was taken into custody. He was very troublesome and had to be handcuffed. Prisoner said he did not know he was in the Police Station until Sunday morning. He was fined 2/6, and given until Saturday to pay. From the Dover Express and East Kent News, Friday, 9 September, 1904. Price 1d. An application by Mr. J. Orman, who for several years has been in the employ of Messrs. Pearson and Son, for permission to draw at the “Barley Mow,” in the place of Mr. W. J. Wardwood, who is leaving on account of his wife's health, was granted. From the Dover Express and East Kent Intelligencer, 16 January, 1914. Price 1d. 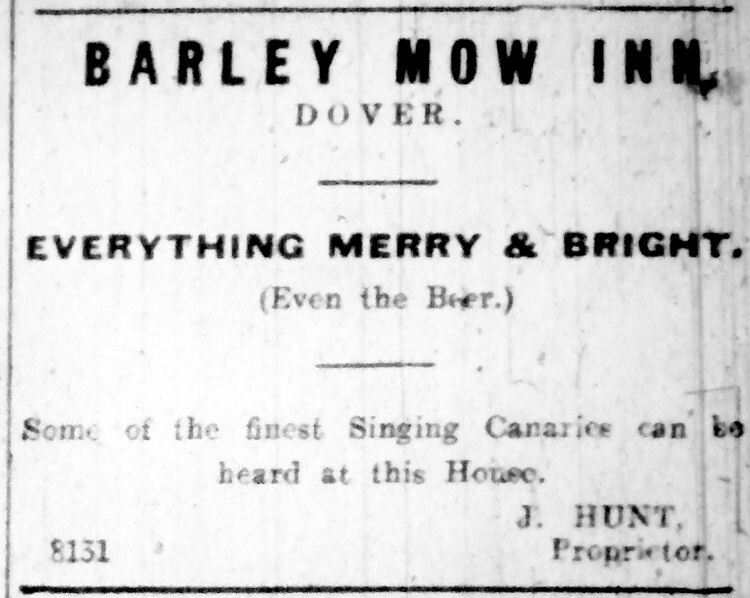 Above shows an advert from the Dover Express 1914. But the end result: It was closed by February 1930 and had disappeared for good by April. The brewer's compensation was £4,548 and licensee, Mrs Mary Hunt, got £475. She moved the same year to the "Salutation". From the Dover Express and East Kent News, Friday 12 August, ???? 1d. On Thursday morning early, shortly before one o'clock a fire broke out in the bar of the "Barley Mow" public house, Strond Street. 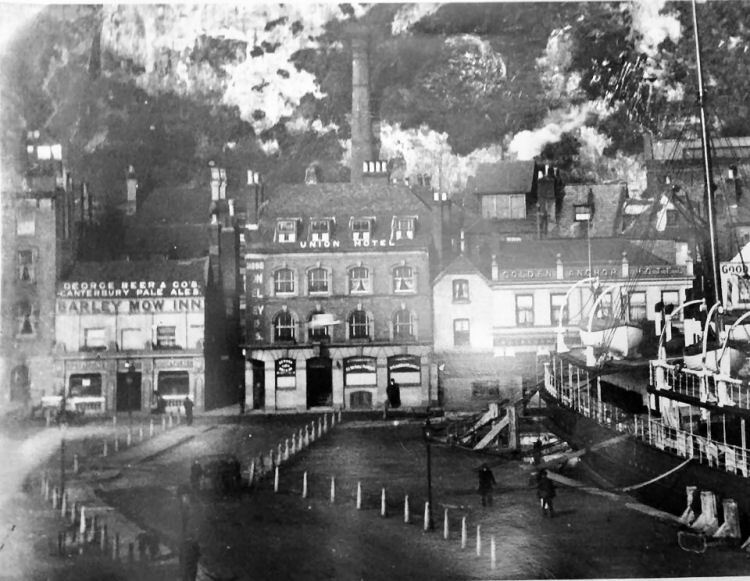 The fire was noticed by some of the Harbour Board's watchmen, who scaled the wall at the back of the premises and got into the bar where the flames were seen, and by applying their hose the fire was extinguished, but not before serious damage was done to the ceiling and counter. The fire, it is thought was purely accidentally originated, it is believed by a lighted match being thrown down on the saw-dust by the counter. Thanks are due to the Harbour Board employees, for their prompt assistance. Dover Express 21st May 1909. At the Dover Police Court on Friday last, James Finney, a young man, was charged with wilfully breaking a square of glass in the bar of the "Barley Mow" public house, Strond Street, doing damage to the extent of £2. 13s. 6d, to the property of James Hunt, the landlord. It appeared that the prisoner was turned out for annoying customers, whereupon he put his fist through the glass. The Bench sent him to prison for a month. Dover Express 29 March 1918. Mr. James Hunt, for 13 years licensee of the "Barley Mow" Inn, Dover, is missing. Age, 50; Height, 5ft. 7in; stout build; grey eyes. Early in January he stayed at Southend for a rest and change, and then went to London, where he wrote affectionate letters to his wife for a week, since when all trace of him has been lost. Mr. Hunt is an experienced sick attendant and masseur, having served in the R. A. M. C. and may have taken up some such occupation. It is feared he is suffering from loss of memory. Anyone able to throw light on his whereabouts is asked to write to Mrs. Hunt, "Barley Mow Inn," Commercial Quay, Dover. From the Dover Express, 29 November 1929. Compensation to the Commercial Quay public houses. In the case of the "Barley Mow Inn," the shares were not agreed. Mr. C. E. T. Rogers (Rogers and Stevens, Rochester), for Mrs. Mary Ann Hunt, the licensee, set out figures as to trade and profits, upon which he claim £571, including £100 in respect of good conduct and long tenancy. Mr Rutley Mowll, for George Beer and Rigden Ltd, Faversham, put the Company's Chairman, Mr Jennings, in the box and he quoted figures upon which was based on offer of £870, including the £100 mentioned. After retirement the Justices awarded £475 to Mrs. Hunt and £4,548 to the brewers. Dover Express 06 December 1935. The death occurred on November 28th, of Mr. James Hunt, late of the "Barley Mow," Commercial Quay, at the age of 67 years. The funeral took place on Wednesday, at St. Mary's Cemetery, the Rev. C. K. Chadwick officiating. From an email received from a Shan Siggers from Buckinghamshire on 7 Dec 2009, I am told that the Hunt's were great great grand-parents of theirs and they believe that their grand-mother and siblings were born there.